I have been a long time fan of flea markets, antique shops and Trade Days and have very fond memories of traveling with my mom to First Monday Trade Days in Canton, the largest flea market on the planet. 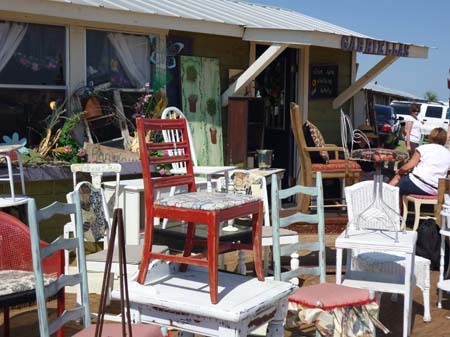 However, Austin doesn't really have a flea market, at least one that I am completely unaware of. So, when I saw a sign advertising Trade Days in Fredericksburg, I made a mental note to visit the next one. That next one is happening right now! We made a special trip there yesterday and was pleasantly surprised. It's nowhere near the size of Canton but there are a lot of good finds. Shabby chic furniture, antiques, hats, food, jewelry, everything Texas, and my favorite rocking chairs. I can't wait to go back with a truck.